“Huckleberry Finn’s Big River” presented by Adventure Theatre with book by William Hauptman and Music and Lyrics by Roger Miller had its world premiere as a musical for social change. It is produced by Adventure Theatre in co-production with The Lyric Theatre of Oklahoma, in association with Rogers and Hammerstein Theatricals and First Stage. The show has been adapted from the musical which was first done on Broadway in 1985 by Hauptman, himself, to make it a show that even very young children can enjoy and to make it one where some of the main characters can be portrayed by young adults still in grade school. The changes are obvious to anyone familiar to the novel by Mark Twain, The Adventure of Huckleberry Finn, or that original production of “Big River: The Adventures of Huckleberry Finn” that won 7 Tony Awards including ones for Hauptman, Miller and for Best Musical. Hauptman changed a few noticeable features of the original production. First of all, he cut the time to about one hour. Some of the songs have been cut or moved in the framework of the story. The language was changed to keep it inoffensive to a young audience, especially the use of racial slurs. If you know the Twain tale at all, you will note that the slave, Jim, is now a teen and not an adult male. However, this is a great show for its young audience. When I attended, there were even some toddlers there. Keeping the length to one hour helps keep the little ones focused. With few exceptions, they all seemed enrapt. If you want to introduce your children of almost any age to musical theatre and to the works of Mark Twain, this is a perfect spot to take them. Due to the ages of the cast, there are two casts for the younger players. I saw the Blue Cast. There is also a Green Cast. Gerecht is a captivating Huck. He captures the rough exterior of this symbolic literary figure. Butts is a great choice for this younger version of Jim. He reflects Jim’s need to be free and brings him inner strength. Both young men carry this show very well on their shoulders. Schwartz and Rakotomaniraka play Huck and Jim in the Green Cast. The supporting cast includes a few “grown-ups” who are in both casts. Schleigh, as The Duke, and Simon as The King reflect their theatrical experience and play up the villainy of these two parts. Also, providing talent in supporting roles are Sally Anne Sillers as the Widow Douglas, Strange Fellow and Sally Phelps, and Calvin Malone as Sheriff, Judge Thatcher, Sternman and Silas Phelps. All four have strong voices and are part of the strong vocal ensemble. In the Blue Cast Shockey gives a fine performance as the sweet and pretty Mary Jane and Alexa Givens also do a remarkable portrayal of the slave Alice. Miller’s gospel song, “How Blessed We Are” is sung by Givens and is a real highlight of the production. Ella Coulson plays Mary Jane and Madisyn Brown plays Alice in the Green Cast. This show, however, is really a vehicle for the music, and you won’t want to miss Jim, Huck and the ensemble singing “Muddy Water” and “River in the Rain.” Both pieces are reflective of Roger Miller’s great talent which had country roots but crossed the charts due to its universal appeal. 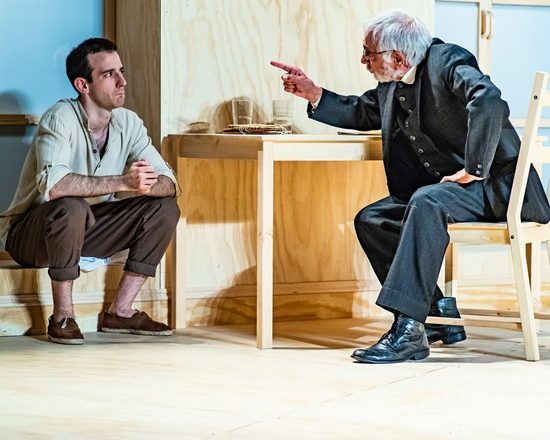 Michael Baron’s direction is clever, and he uses his young actors to their best advantage. Tiffany Holmes is the Musical Director and does well with this young cast, bringing their amazing voices to the forefront. I also thought Debra Kim Sivigny’s scenic design was appealing and practical in recreating the physical structures of Twain’s time as well as the raft and river. If you want to introduce your children of almost any age to musical theatre and to the works of Mark Twain, this is a perfect spot to take them. Tickets are selling fast. So, pick your date quickly and buy online. Running Time: Approximately one hour with no intermission. 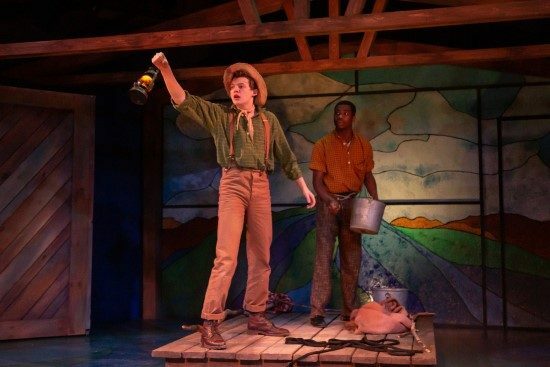 “Huckleberry Finn’s Big River” plays until March 10, 2019, at Adventure Theatre & ATMTC Academy at Glen Echo Park, 7300 MacArthur Blvd, Glen Echo, MD. Buy tickets online. Ms. Brall is a graduate of the City College of New York with a B.A. in Theater. She has an M.A. in Theater from the State University of New York in Binghamton with a concentration in Directing. Growing up in New York City gave her a chance to see many Broadway and Off-Broadway productions. After college she worked as a Recreational Therapist and Activities Director. In that capacity she edited several house newsletters. Although not directly employed in Theater, Ms. Brall worked in community theater in this area as well as New Jersey and central Pennsylvania as a director, assistant director, stage manager and other behind the scenes jobs. She also served as president of the former Columbia Community Players. Ms. Brall also teaches improve at a local Sunday School.